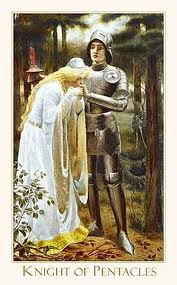 Weekend Reading: Knight of Pentacles from the Victorian Romantic. Focus your efforts on home and security this weekend. You may find yourself single minded at times, but you'll get the job done. And you'll put yourself in a good position for next weekend when you can lay back. But this weekend, slay one dragon after another until the job's complete.